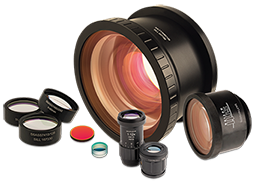 The product portfolio of Sill Optics ranges from simple collimation- and focusing optics to beam expanders to telecentric and non-telecentric scan lenses. We cover thereby the complete wavelength range from 193 nm to 1980 nm. Mainly applications with solid state lasers around 1064 nm and its harmonic generations are covered. Furthermore, we provide lenses designed for disc lasers and fiber lasers in the range of 1030 nm to 1090 nm, as well as diode lasers from 800 nm to 980 nm or 900 nm to 1070 nm. Additionally many of our lenses, beam expanders and lens systems are optimized for the use with short pulse lasers (picosecond range) and ultra-short pulse lasers (femtosecond range). Lenses are also offered for very short wavelengths around 193 nm and 248 nm, but also for more long-wave radiation in the near and mid infrared regime (1550nm and 1980nm). A large selection of multispectral scan lenses allow monitoring through the used optics or use of multiple wavelengths and complete the range of our scan lens product range. Our catalog does only express our most common products. In addition we offer custom made systems of special ƒ-theta lenses up to complex opto-mechanical systems. Our resources comprise both extensive experience in optical design with Zemax and mechanical engineering with SolidWorks. Production with modern technologies from single prototypes up to medium quantities are possible to fulfill exceptional requirements. We welcome every challenge and are looking forward to receive your inquiry.